Strawberries are native to Europe, however, nowadays cultivated in many temperate regions all over the world as an important commercial crop. The Strawberry is called ‘the queen of fruits” in Asian countries because it’s packed with goodness. Healthy nutrients in dried strawberries include vitamin C, potassium, fiber and folate. In addition, dried strawberries contain antioxidant phytochemicals such as ellagic acid, quercetin, kaempferol and phenolic acid. 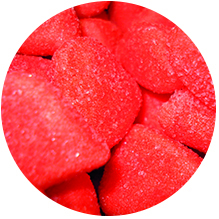 Dried Strawberries are excellent for cereals, muffins, fruit juices, ice creams, cakes and snacks.